The Irish general election of 1923 was held on 27 August 1923. The newly elected members of the 4th Dáil assembled at Leinster House on 19 September when the new President of the Executive Council and Executive Council of the Irish Free State were appointed. The election was held just after the end of the Irish Civil War. Many of the Republican TDs, who represented the losing anti-Treaty side, were still imprisoned during and after the election. Cumann na nGaedheal, who represented the winning side in the war, also won the election and formed the government. Percentage of seats gained by each of the three major parties, and number of seats gained by smaller parties and independents. Cumann na nGaedheal minority government formed. Most parties made gains, in part because the total number of seats in the Dáil was increased by 25 from 128 to 153. Cumann na nGaedheal were able to form a minority government while Republicans (Anti-Treaty) abstained from taking their seats in the Dáil. Lax electoral practices were tightened up beforehand by the new The Prevention of Electoral Abuses Act, 1923. Department of Local Government and Public Health (July 1924). Memorandum on the conduct of the general election to Dáil Éireann held on the 27th August, 1923 (PDF). Dublin. Retrieved 2 February 2018. ^ Hopkinson, Michael (1988). Green Against Green: The Irish Civil War. Dublin: Gill and Macmillan. p. 262. ISBN 0-7171-3760-0. Despite the absence of many Sinn Féin candidates and workers in jail, the results were surprising good for the Republicans. Cumann na nGaedheal, the newly formed government party, had 63 candidates elected, compared with 44 Republicans. ^ "4th Dáil 1923 General Election". ElectionsIreland.org. Retrieved 5 April 2009. ^ "Dáil elections since 1918". ARK Northern Ireland. Retrieved 13 April 2009. ^ a b Cumann na nGaedheal's results are compared with those of the Pro-Treaty faction of Sinn Féin in the previous general election. 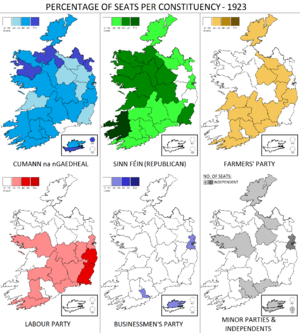 Results given for Republicans here are compared to those won by the Anti-Treaty faction of Sinn Féin in the previous election. ^ Andrew O'Shaughnessy and Richard Beamish were elected under the label of Cork Progressive Association, a group associated with the Businessmen's Party. ^ "The Prevention of Electoral Abuses Act, 1923". Office of the Attorney General of Ireland. Retrieved 5 April 2009.